LINCOLN, Maine - Al Roy gets a lovely view of the sun rising over Rollins Mountain and glinting off Egg Pond. So do fellow Egg Pond Road residents Harry Washburn and Donald Smith. The three attended a public hearing at Mattanawcook Academy on Wednesday to see how Evergreen Wind Power LLC’s proposed $120 million wind farm would appear if it gets Maine Department of Environmental Protection approval and is built on Rollins Mountain. "If I had known it [the wind farm] would look like this," Washburn said, "I would never have put in all the work I have done on my place." "If this project goes through," Roy said, "it should be postponed for two years so landowners near it can sell their properties." Conversely, resident Alan Smith thought the project would help satisfy the state’s growing electricity demand. "Do you want to look at that," Smith said of the windmills, "or a smokestack? I would love to look out the window and see nothing but nature, but that’s unrealistic. I still want to turn on the light switch, too." At least 65 people attended the DEP-required hearing. If approved, the 389-foot windmills would run through Lincoln from Burlington to Lee and Winn. 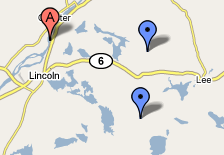 Lincoln would have 19 or 20 turbines; Winn, three; Lee, seven; and Burlington, 12. Two turbine sites are listed as alternates, company officials have said. The project would generate as much as 60 megawatts at peak periods and include 8.8 miles of 115,000-volt electrical line, an interconnection facility in Mattawamkeag, a substation in Lee and an operations facility in Lincoln, Evergreen officials said. About 12.6 miles of new roads, and 3.7 miles of improvements to existing roads, will also occur. Wind farm critics contend that they are noisy eyesores that foil landscapes, often fail to generate their peak capacities, and — given that their electricity often is sold elsewhere in New England — provide little direct benefit to host municipalities. Proponents say the farms create no air or water pollution; lessen dependency on oil; and tap into a limitless natural resource while hedging against the electricity droughts seen in California. Evergreen claims the project will generate 168 million kilowatt-hours of electricity annually. Evergreen is a subsidiary of First Wind of Massachusetts, the state’s largest producer of wind-to-energy facilities. First Wind is building a 38-turbine farm on Stetson Mountain between Danforth and Springfield and operating a 28-turbine wind farm in Mars Hill. The company will submit its Rollins Mountain application to DEP by October, said Ryan Chayters, a senior development associate with First Wind. Mars Hill resident Wendy Todd had a message for Rollins Mountain-area residents — be cautious. "First Wind had a job to do: to sell this project," said Todd, who believes the Mars Hill project’s problems outweigh its benefits. "They don’t lie, but they don’t tell the whole truth. Consider everything you hear very carefully." As examples: the Natural Resources Council of Maine accurately states that Mars Hill will receive $500,000 annually for 20 years for hosting the project, but doesn’t mention that the state Department of Education effectively reduced that figure by $249,000 by factoring the new money into its assessments. They said First Wind employed 300 people during the Mars Hill construction, but most came from southern Maine, she said. Few local contractors or residents were qualified to do the work. And the noise the project makes, she said, is occasionally nightmarish. "My worries are that small towns have no one to help them to understand these projects as a whole," Todd said. "They don’t know what to expect. They cannot fathom these things."